Thanks to a sample of Skrei from the Norwegian Seafood Council, we’ve been enjoying more fish, specifically cod, of late. One portion was stir-fried with mirin and chives, another was battered and deep fried and one smaller portion was stretched into a filling fish, leek and egg pie. Next on the list was miso cod. A signature dish for many restaurants all around the world, it’s probably most strongly associated with Nobu Matsuhisa who makes his recipe with black cod. Black cod is part of the Notothenia genus whereas the species we’re more familiar with, such as Atlantic, Pacific or Greenland cod are from the Gadus genus. To confuse things further, Sablefish, an unrelated species, is often colloquially called black cod, as is Maori rockcod. If you are keen to recreate the Nobu black cod version of this dish, make sure you buy the right fish (Notothenia microlepidota) and be aware that it’s fattier and more fragile than Gadus cod. Matsuhisa steeps the black cod in his marinade for a few days before cooking, but for my Skrei fillets, I was happy to make a far quicker version – mixing a simple marinade, smearing it generously over my cod fillets and grilling straight away, until the fish was cooked through and the miso marinade bubbling and charred. Miso is a key seasoning and ingredient in Japanese cooking. Produced by fermenting soybeans, grains and salt with a mould fungus, the result is a thick, intensely savoury paste which is high in protein and rich in vitamins and minerals. There are many types of miso available in Japan, the most common two being red and white. Both are made with soybeans and rice, though white miso has a higher percentage of rice than its red counterpart. There are also other types that are made with different grains such as barley, buckwheat or rye. Miso also becomes darker with age, with some vintage red misos turning almost black in colour. Note: White miso has a slightly sweeter and milder flavour than the red version, which suits this recipe well. However, you can use red miso instead if you wish; you may want to use a touch less, in that case. Preheat your grill to a medium hot setting. Heat the mirin, white miso paste and sugar in a small saucepan, over a gentle heat, until the sugar has completely dissolved. Place the fillets of fish skin side down on a piece of foil. Spread the paste generously over the surface of the fish, top side only. 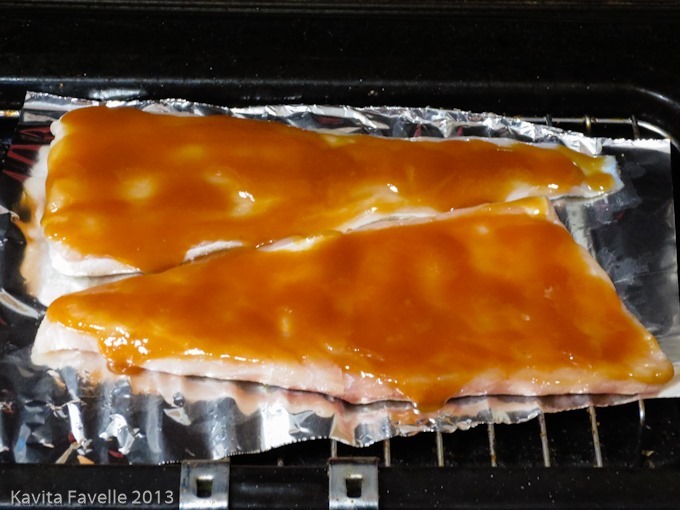 Grill until the fish is cooked through and the paste is bubbling and starting to char. For these fairly thin fillets, this took about 4 minutes; for the thicker fillets we did the second time, they needed 7. Note: Last time we made this we added a handful of wild garlic leaves into the stir fry too. Carefully pull all the leaves from the pak choi and wash thoroughly. As you put your fish under the grill, heat some sesame oil in a wok or large frying pan. Stir fry the pak choi for 2 to 3 minutes, until the dark green leaves have wilted and the harder stems have softened just a little. I love this simple miso marinade – an earthy savoury flavour balanced with a touch of sweetness. And the same marinade can also be used on vegetables – indeed the popular dish, nasu dengaku, is made by spreading it onto halved aubergines, though you usually need to grill them a little first, before applying the marinade and grilling again. Both the fish and the pak choi need minimal preparation, and take only a few minutes to cook, so this is an ideal dish to make when cooking time is short. If you keep miso paste, mirin and sesame oil in your store cupboard, you just need to pick up fresh fish and pak choi on the way home. These days, many supermarkets stock both miso paste and mirin, but if you can’t find them, try online suppliers such as Japan Centre and Sous Chef. With thanks to the Norwegian Seafood Council for the Norwegian skrei (cod) sample. 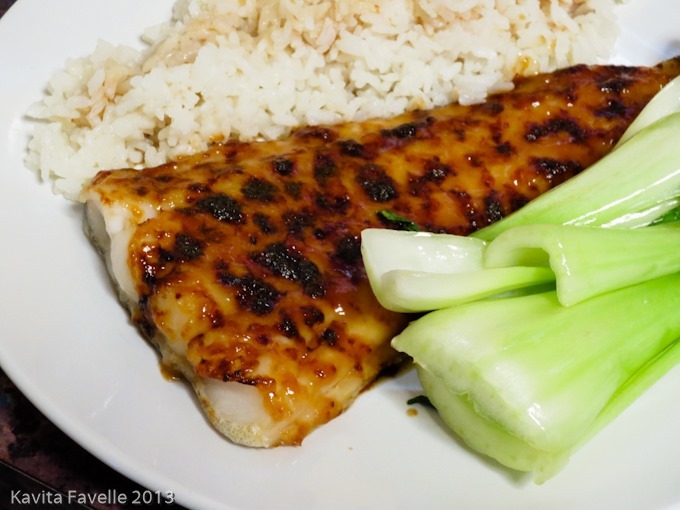 7 Comments to "Simple Miso Cod with Sesame Pak Choi"
Yum – quick, easy and healthy. I might try this, looks delicious. I recently bought some miso, not the white one though as I couldn’t find it. I tried once cod with miso in the restaurant and it was very tasty… never thought I could make it at home, thanks for sharing. A lot of restaurants tend to serve black cod with miso and black cod is a different type of fish from the cod we know, a different texture. 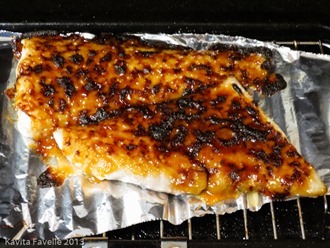 But the miso marinade works so well on regular cod, and I think it’s also nice on salmon though the overall taste is, of course, different.